Seth Lipsky says our founding document is especially vital today, in an age of expanding state power. NEW YORK--Seth Lipsky has a knack for seeing the bright side of things. A nearly 20-year veteran of this newspaper, including its editorial page, he cheerfully acknowledges the obvious: This is far from a golden age of free-market conservatism. Of President Obama, he tells me over lunch, "I sense that he has a very leftist, socialist-oriented worldview." Yet this makes Mr. Lipsky anything but grim: "I for one find this very exciting. . . . We're just at a great moment." Why? Because, he says, "America is in what I call a constitutional moment." Mr. Obama's efforts to expand government power raise basic questions about the constitutional limits of that power. 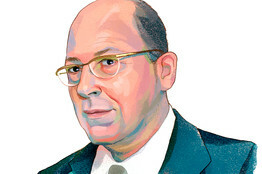 "The enumerated-powers argument is enormous," Mr. Lipsky says. "It's just enormous, the ground that is open for contest here. . . . Right now, we're at a moment where we're not going to be able to turn to either the Congress or the executive branch for help on this." He believes "the only defense now, the only tool we have now, is the Constitution. That's why I call it a constitutional moment, as opposed to a political moment." That makes it an auspicious moment for Mr. Lipsky's new book, "The Citizen's Constitution: An Annotated Guide." The U.S. Constitution is a brief document, taking up just 42 pages in a popular pocket-size edition from the Cato Institute. Mr. Lipsky expands it to 287 pages of 5 by 8 inches, by way of 327 lengthy footnotes in which he discusses each and every constitutional clause in the context of history, case law and current events. There are an additional 36 pages of bibliographic references, making it the only book I've seen in which the footnotes have endnotes. Mr. Lipsky doesn't remember exactly when he thought of the idea, but he believes it was in the late 1980s. "I got into an argument over abortion and was talking to someone about the right to privacy," he recalls. "I looked at a pamphlet the government had issued with a text-only edition of the Constitution, and I realized I couldn't find the word 'privacy' in the Constitution. I began to think about a better edition." Mr. Lipsky's edition has an index, where the listing for "privacy, right to" directs the reader to the chapters on the Third, Ninth and 14th amendments. As a newspaperman for 40-plus years--in addition to working for the Journal, he founded two papers of his own--Mr. Lipsky has built a career on the First Amendment. But his enthusiasm extends as well to the preamble, the original seven articles and the 26 other amendments. "For years I've been sending memos to people who worked for me--desk editors, reporters, editorial writers--constantly trying to raise their consciousness about the usefulness of the Constitution in editorial work," he says. "Usually these memos that I would send would be simple memos, like, 'Where the hell does the Congress get the power to do that?' or, 'The New York Sun will not carry a dispatch about the Second Amendment which does not quote Justice Story as saying the Second Amendment is the palladium of our liberties.' "
In 1968, after graduating from Harvard, Mr. Lipsky took a reporting job at the Anniston Star in Alabama. He was there just seven months before he was drafted and sent to Vietnam, but it was long enough to provide a formative experience. He visited Frank Johnson, then a federal district judge, who had been a member of the three-judge panel that ordered the desegregation of Montgomery buses after Rosa Parks's arrest. Johnson also presided over Lee v. Macon County, a school-desegregation case that began in 1963. "Johnson says, 'As ex officio chairman of the state board of education, you have the power to tell the school board of Macon County, Alabama, that they can't integrate the school?' And the governor says, 'Yes, your honor, I do.' The judge says, 'Well, then, I'm ordering you to integrate all 67 counties in Alabama.' "
In Vietnam, Mr. Lipsky worked as a combat reporter for Pacific Stars and Stripes. Returning to civilian life, he joined the Journal in Detroit, with later postings in Hong Kong, New York and Brussels. He left in 1990 to start an English-language weekly edition of the Forward, a venerable Yiddish newspaper. In 2002, he founded the daily New York Sun--or rather he revived it, the original Sun having folded in 1950. The new Sun attracted a small but influential readership and gave many aspiring writers their start. It ceased publication last year, although Mr. Lipsky and a small stable of writers still publish occasional stories at nysun.com. The optimism that drove Mr. Lipsky to start a daily newspaper in the Internet age also informs his view of the prospects for American governance. "One of the wonderful things about the Constitution is that anybody can play," he says. "Ordinary people asking simple questions have affected the country in enormous ways using this document. . . . It's just astounding the way individual predicaments and problems are used by the [Supreme] Court to lay down broad principles in the country." To prove his point, he cites examples from the 1930s, the 1960s and the current decade. The 1935 case of Schechter Poultry Corp. v. U.S. was decided at a time when the liberal political juggernaut looked even more unstoppable than today. Mr. Lipsky describes the facts: Enforcing the National Industrial Recovery Act, which gave the president vast powers to regulate business, "government thugs went into the kosher butcher shop of the Schechter family in Brooklyn, and they arrested its proprietor on criminal charges." Among the charges: permitting a housewife "to pick which chicken she wanted." This measure provoked some levity during oral arguments at the Supreme Court: "The judges are asking a question about, 'How is the housewife supposed to pick out her chicken when she can't look at it?' Schechter's lawyer reaches over his shoulder into an imaginary cage and starts pitching around for a chicken, and the Supreme Court started laughing." Gideon v. Wainwright (1963) "involved this guy who was arrested in Florida for robbing a poolroom. He goes into the court and says, 'The Supreme Court says I have a right to a lawyer.' The judge says . . . something to the effect of, 'Not in the state of Florida, you don't.' He gets convicted; he gets sent to prison. While he's in prison, he goes to the prison library. This derelict basically writes an appeal to the Supreme Court . . . in pencil and paper--a pauper's petition that says, 'I have a right to a lawyer.' The Supreme Court notices it, assigns Abe Fortas"--who himself joined the court in 1965--"to defend him. He wins the right to a lawyer for everyone accused of a crime in America. The name of Clarence Earl Gideon will be remembered as long as there is a law." Last year's District of Columbia v. Heller, in which the court held that the Second Amendment protects an individual right to own firearms, exemplifies Mr. Lipsky's point that the language of the Constitution retains its power even when long ignored. "We've had 200 years, and nothing's ever been done about this," he says. "For 50 of the 200 years, the New York Times has been sneering at the idea of an individual right, and everybody's been talking about how this right belongs to the 'militia.' "
Yet by carefully analyzing the language of the Second Amendment, the court cast aside that musty conventional wisdom. Mr. Lipsky, who describes himself as "a partisan of the plain-language school of the law," applauds not just the result but the method the justices, in an opinion by Antonin Scalia, employed to reach it: "They really get into the language. I mean, the actual grammar, the sentence structure, the subordinate and not-subordinate clauses, which--forgive me, but I've been arguing for a generation and a half as an editorial writer, the plain language of this thing is plain." Although anybody can play, not everybody can win. In 2003, the high court ruled against Susette Kelo and allowed the city of New London, Conn., to seize her house under eminent domain and turn the land over to private developers. "It's just unbelievable, that case," Mr. Lipsky says--and all the more so in light of the latest development, or rather the lack of development. On Monday, Pfizer Inc., which was to have built offices on the now-barren site, announced that it was leaving New London altogether as part of a consolidation move. Such disappointments notwithstanding, Mr. Lipsky's passion for the Constitution is a tonic for political depression. If ObamaCare does become law, to take an especially worrying example, it isn't hard to imagine a lot of Americans facing "individual predicaments," including threats to their lives from government rationing. It's some comfort to think they'll be able to petition for a stay--and to demand an answer to the question in that old Lipsky memo: "Where the hell does the Congress get the power to do that?"